Isaac Biggs is a great friend of mine, a hard worker, and mechanically minded. As a hobby, he builds furniture in his off time from scrap wood supplied by contractor friends or from leftover jobsite material. 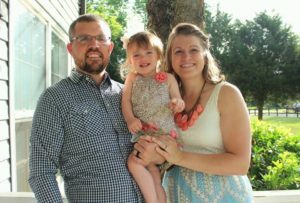 Isaac’s wife Elizabeth has been excelling as a student in the education program at Vanderbilt over the past 4 years all while giving birth and helping raise their daughter, Evelyn. Sadly to friends in Nashville, the Biggs’ have accepted a job offer to the University of Illinois! Although Isaac is a professional electrician, working in both the commercial and residential environment, he has asked me for tips for selecting a new home in Champaign. As I began creating a list of items that Isaac should consider when looking for his new home, I realized how valuable this list could be for anyone considering purchasing a new home. Our goal at Magnolia Property Consultants is to partner homebuyers with construction industry expertise. We do this because we understand not everyone has a brother, uncle, parent or family friend with construction experience that they can get honest, unbiased advice from when making such an important decision. Buying a home is often the largest investment a person will make in their life, and having a trusted ally that understands not only what is wrong with a house, but why it is wrong, can make all the difference between a sound investment and a terrible mistake. Below is the list I created for Isaac. Please feel free to bring it with you the next time you are considering purchasing a home or condo. Be sure to ask all these questions below, and be thorough before making an offer. #1 Question: Is Water an Issue at this property? Are there cracks in the drywall corners of the rooms? Ask for Service Records on the HVAC equipment. Regular maintenance can be a great indication of the condition of the equipment. The main purpose of this list is to train your brain and your eye to ignore the superficial and to focus on the important, foundational issues. Our brains can often be seduced by shiny appliances and beautiful floors, so having this list should help you stay focused on what’s important when buying your new home!